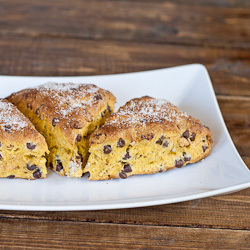 I kinda like scones, though I never tried to add pumpkin as an ingredient. Weird enough, these little things were ready in no time and the taste… simply delicious. Well you have to make them yourself, to really experience the joy of having one every morning. Anyway, start by mixing all the dry ingredients together, including sugar and spices. Add the cubed butter, and using a pastry cutter, cut in the butter until it resembles small peas. Next add the chocolate chips and pecans. In another medium size bowl, mix the pumpkin puree with the eggs. Add the pumpkin to the dry ingredients, and using a spatula mix everything together. Now you have a couple options here, you can form the dough in 2 disks and make 6 smaller scones, or you can form it in one disk and make 8 larger ones. The disks should be about ¾ of an inch (2 cm) in thickness. Lay your scones on a cookie sheet lined with parchment paper or a silicone baking mat and then place the tray in the freezer, for about 30 minutes. In the meantime, preheat the oven to 425° F / 220° C. After 30 minutes, brush the scones with milk and sprinkle some sugar on top and bake for about 20 to 25 minutes, or until you stick a toothpick down the middle of a scone and it comes out clean. Mix all the dry ingredients together, including sugar and spices. Add the cubed butter, and using a pastry cutter, cut in the butter until it resembles small peas. Add the chocolate chips and pecans. Add the pumpkin to the dry ingredients, and using a spatula mix everything together. You can form the dough in 2 disks and make 6 smaller scones, or you can form it in one disk and make 8 larger ones. The disks should be about ¾ of an inch (2 cm) in thickness. Lay your scones on a cookie sheet lined with parchment paper or a silicone baking mat and then place the tray in the freezer, for about 30 minutes. Preheat the oven to 425° F / 220° C.
After 30 minutes, brush the scones with milk and sprinkle some sugar on top and bake for about 20 to 25 minutes, or until you stick a toothpick down the middle of a scone and it comes out clean. Love sconesss.. the combo sounds dreamy..